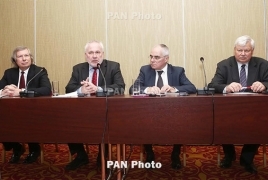 PanARMENIAN.Net - The co-chairs of the OSCE Minsk Group said in a statement on Tuesday, May 15 expect to meet with the new Armenian leadership in June. Igor Popov of Russia, Stephane Visconti of France, and Andrew Schofer of the United States, together with the Personal Representative of the OSCE Chairperson-in-Office Andrzej Kasprzyk, met Foreign Minister of Azerbaijan Elmar Mammadyarov on Tuesday. "The Minister and co-chairs discussed modalities for moving the peace process forward. The Personal Representative informed the participants regarding the relatively stable situation on the line of contact," the statement said. "Minister Mammadyarov expressed Azerbaijan's readiness to resume active negotiations as soon as possible." The co-chairs last visited the region in February 2018.